That's just something I came across on the interwebs recently and wanted to share. I thought Michelle (who reads this blog) and Jeremy might appreciate it, among others. The original line is clearly the writers' way of telling the fans "don't bother trying to figure out how time works in this show; you just have to trust us when we tell you the Doctor can't cross his own timeline and stuff." 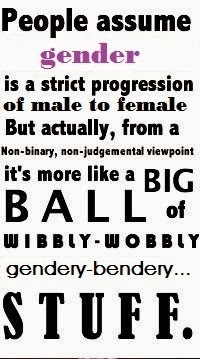 And of course, that's often how gender is, too. Ultimately, we kind of just have to take people's word for it that they experience it the way they do.